Bangladesh Sena Army Job Circular 2018 - 2019. 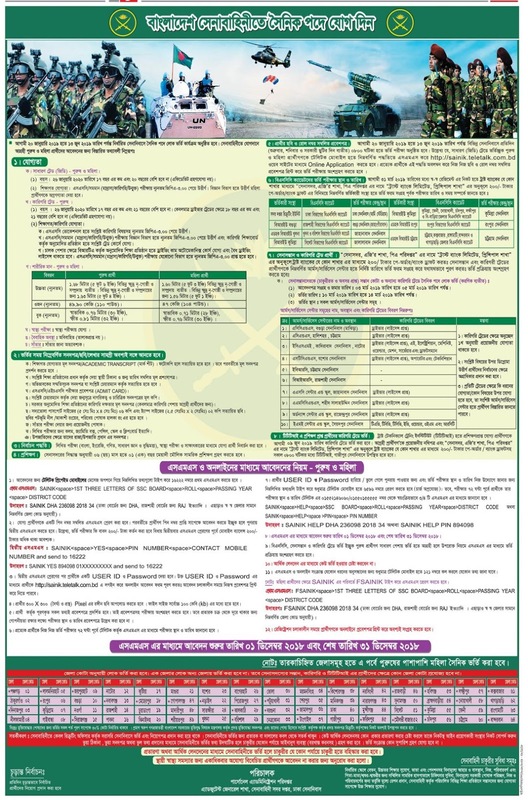 From Jan 20, 2019 to June 13, 2019, in the cantonment of the cantonment, people will be held in the public admission process, see detailed advertisement. Application End Date : Application will be started on 01 December 2018 and ends on 31 December 2018. Educational qualification: Must be at least GPA 3.00 in SSC examination. Age: 26 January 2020 will be between 17 to 20 years. Physical fitness: Height of 1.68 meters (5 feet 6 inches), male 49.90 kg (110 lbs), male size is 0.76 meters (30 inches) in normal condition, 0.81 meters (32 inches) ). The height of the female candidates is 1.60 meters (5 feet 3 inches), weight 47 kg (103 lbs), the chest size is 0.71 meters (28 inches) in normal condition, 0.76 meters (30 inches) in the expanded area. Application Process: Candidate will have to send two separate SMS through Teletalk SIM and apply. Below is a detailed discussion. 1st SMS: SAINIK <space> First 3 characters of SSC board <space> Roll <space> next year <space> District Code You must send it to 16222 number. 2nd SMS: SAINIK <space> YES <space> PIN NUMBER <space> Candidate's number. You must send it to 16222 number. After 2nd SMS the candidate will be given a USER ID and Password. With this User ID and Password, the candidate will need to login to http://sainik.teletalk.com.bd and complete the online application form. Note: In case of female candidates, send SMS by typing FSAINIK instead of SAINIK.